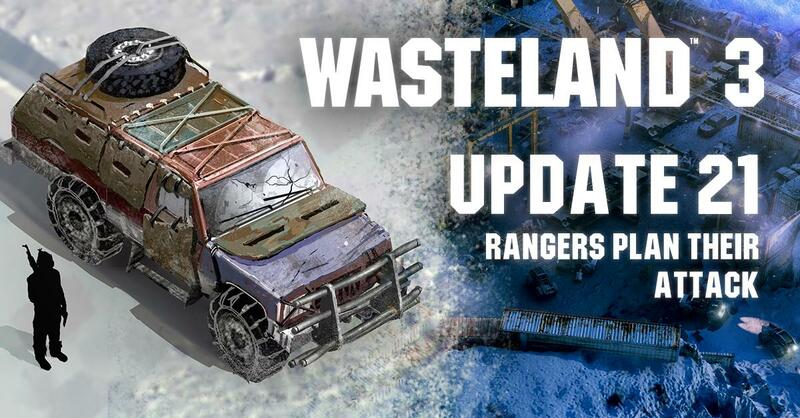 In this update, we lead with inXile's newest title, discuss how that launch affects Wasteland 3's production team, give fans a first look at vehicles in the game, do some community stuff, and pass along our latest crowdfunding recommendations. Back when inXile opened a new studio in New Orleans, a number of key developers who played vital roles on Wasteland 2 ended up moving to the new studio. Now that Wasteland 3 is in production, we're very happy to bring some familiar faces back into the fold. Wasteland 2 level designers/scripters Jeremy Kopman, Ben Moise, Joby Bednar, and Zack Vulaj are all back to work on Wasteland 3, as is engineer Jeffrey Corrales. As you can imagine, bringing people in that are so familiar with the tools and setting means we can really hit the ground running. Having this kind of veteran carryover makes us very confident that our team gets what makes Wasteland tick and knows what lessons we want to carry over from the previous project. But if you move around in that or another car - make a video with that and show it off. So will vehicles just be something that you use on the travel map? I imagine that having them inside maps would cause innumerable issues. Nope. They stated very early in the founding that vehicles will be usable in some (not all) battles. Yeah, they show a ranger using a vehicle-mounted turret during one of the bits of teaser footage. It definitely seems like we'll be able to use vehicles as cover and stationary gun platforms, but we don't know if we'll be able to actually drive them around in combat. I'm definitely looking forward to finding out more. We now have a vehicle playground, a test scene in Unity that we're using to drive around in so we can figure out our parameters for fun vehicle gameplay. While we intend to show that at least one faction in post-apocalyptic Colorado is equipped to build their own vehicles, most of the drivable machines you'll find are examples of ingenuity and resourcefulness, with a healthy dose of auto shop and welding skills thrown in. In this world, scrounged materials can make the difference between barely mobile and fortified, armed transport. 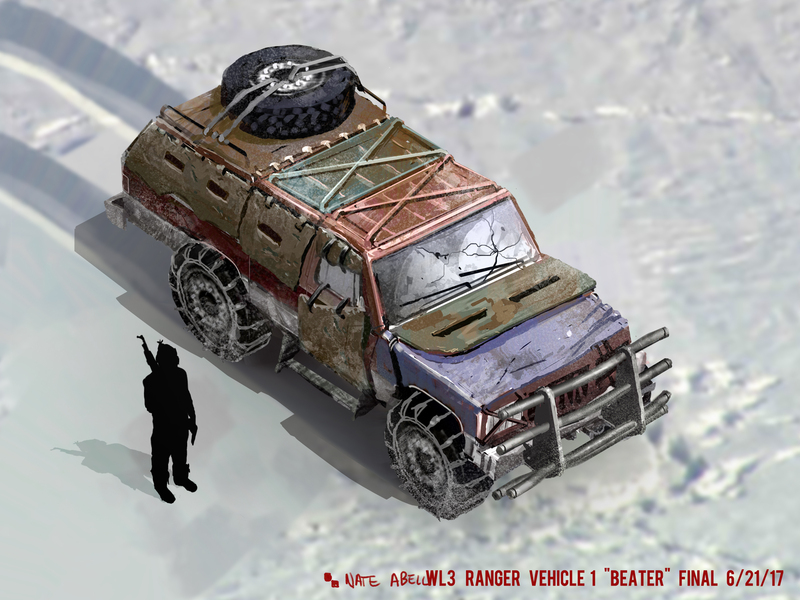 The first vehicle you'll acquire in the game is a bit of a beater. We wanted to provide the player with something that is functional - it can be trusted to get you from point A to point B - but that would be sparse when it comes to weaponry or armor. Our beater has nice big tires and some attached armor plating, so it's a whole lot better than walking. On the other hand, the starting place for those modifications is a vehicle that looks like its previous owner might have been a "soccer mom." Not to worry, if you survive with this puppy, you will be well rewarded with the next vehicle, which is a beast! Yeah, I love the idea of utilizing vehicles as cover and stationary gun platforms. But I don't know if they would/should be derivable, it feels like a whole lot of hassle for a very little gain, and that having this part scripted might be the far better choice. Anyway, I love the idea of utilizing vehicles it feels much more realistic than trecking on foot countrywide, I am intrigued by what other examples of ingenuity and resourcefulness (aka crazy contraptions) we might encounter and I assume that vehicles means tweak to our inventory (a stash system like in POE might be nice). But the vehicles won't move during battles though right? We can't say yet. Of couse you are right in that this would require way more work to integrate. But then what use is a extra cover I can't move in battle? They should stay with boxes, brickwalls and such stuff in THAT case. Unless they plan to make heavy machine guns only usable via car. Would make more sense than the hipshooting those monsters like in WL2. I guess we have to wait until we can play or at least see a video of the battles in the alpha version. We're still prototyping vehicles in combat and exploration alike. It's one of the aspects we're focusing a lot of design and engineering time on. However, as it's one of the major new features for the game we need to put a lot of work into, we're not ready to talk about the full game mechanics and role of vehicles just yet. The problem with moving vehicles is that the will be locked to WL grid based combat, and what abilities they would offer and how do you balance them in combat. Given that most factions likely wouldn't have access to vehicles, having a "tank" will allow you to steamroll everyone.. And IMO maps would look much better if they are designed with vehicles mainly as dropoff map exit points. Anyway, I think that having access to cover in your immediate vicinity can be beneficial and offer them more flexibility in encounter design, like in the trailer when the trade deal go wrong; Brute force may not be the only way to punch a hole in someone defenses; and I would LOVE me some ambush type random encounters where the only other cover around is used by the bandits! Also some if they will have some mission with covert element, it might offer a way to add time pressure i.e. get in/out before enemy patrols will stumble over your ride. Or maybe drop in couple of missions where you'd another teams for backup or choose from few points of ingress.